The marriage was in the morning. I left late from home, and reached late for the marriage. After lunch, I left from the marriage venue. 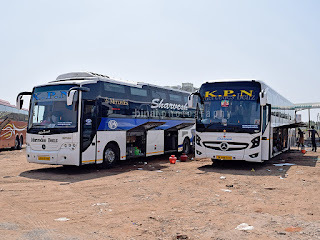 The scheduled pick-up time was only at 1710hrs - so, decided to spend some time at the KSRTC bus station. While at the bus station, my phone switched off due to low battery. I headed to a restaurant to have some refreshment, and in the mean time managed to get the phone charged to remain on till I get into the bus. 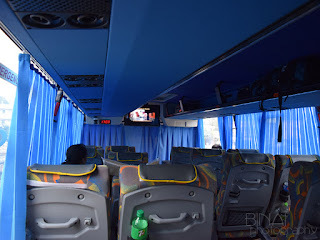 After food, I took an auto from the KSRTC bus station to Chandranagar bypass, where my bus would pick-me up. 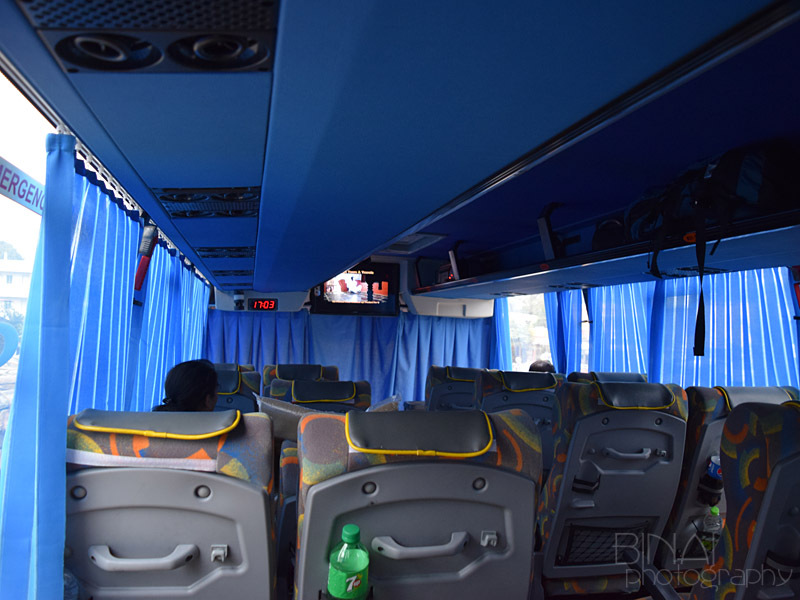 While on the way, I received a call from the bus driver, asking my whereabouts. I was quite shocked since the time was just 1630 then. I thought he was just trying to find where I would stand - but later realised that the bus was already waiting for me! He said we cannot stop there for long, and hence would park a little away from the pick-up point. I reached the bus sometime around 1640hrs, and the bus was neatly parked on the road side, a little away from the pick-up point. One more passenger was yet to turn-up - the driver wasn't complaining, since he was quite early. We started moving from there at 1655hrs - 15 minutes before time. 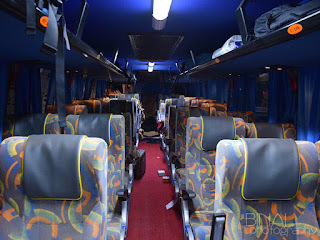 The bus was clean inside out, and a very nice air freshener was used inside. The engine was silent and seemed very refined as compared to the old version. A telugu movie was being played on TV. 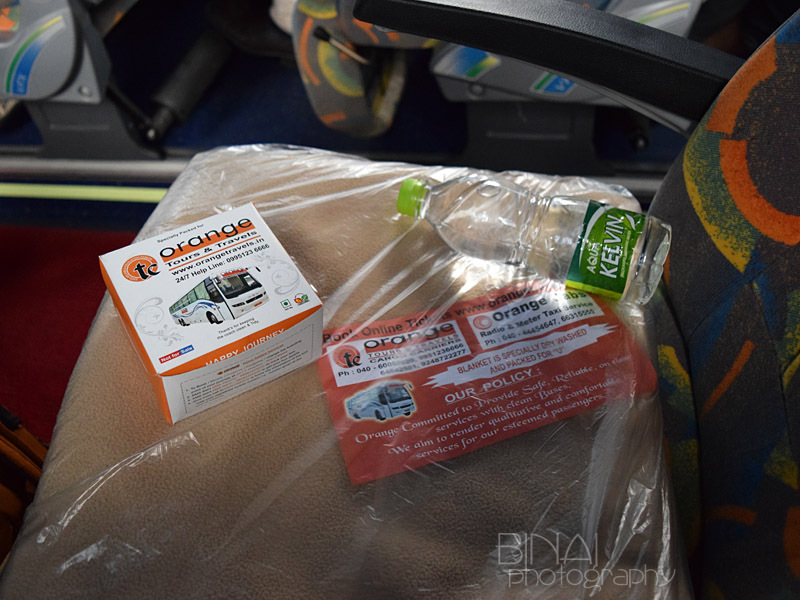 A fresh blanket, packed in a plastic pouch was kept at my seat. 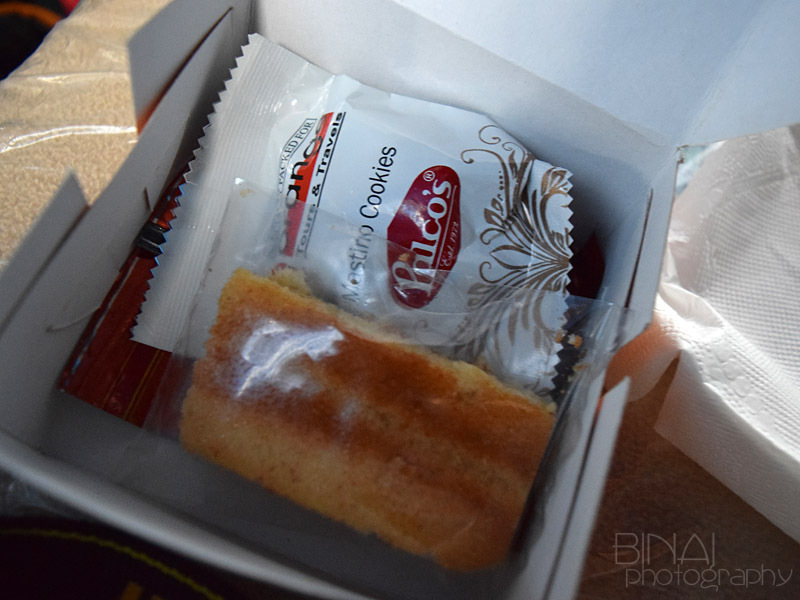 A small cardboard box containing snacks (a slice of cake, a packet each of cookies and namkeen) and a 500-ml bottle of water was also kept at the seat. The attendant did make it a point to come and check if I needed something else. Driving was calm and composed - he did not make rash cuts or any hard braking even after we entered the two lane section after Walayar. I really loved his driving. We had to make a short break at the incoming RTO checkpost at Chavadi for paper checking - we lost about two minutes here. We started moving from there at 1732hrs. The second driver was fast asleep at the last row during this time. Both the drivers were in proper uniform, including an identity card. The attendant also had a uniform. They appeared very professional in looks, and they behaved professionally as well. We reached Neelambur toll at 1813hrs - the bus stopped outside a bakery after the toll gate, and the crew announced a 10 minute break. The break got longer as the pick-up van from Coimbatore got delayed. 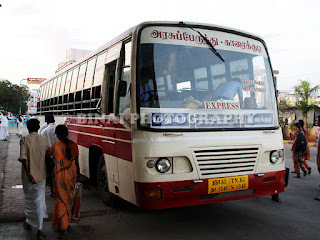 We started off from there at 1833 after picking up passengers from Coimbatore. Inside - a new partition has come up. The bus was almost full by now - with just a few seats empty here and there, including the one next to me. They kept playing a movie one after the other. The bus pulled into a fuel station near Chitode sometime around 1933 - but we did not refuel, and got moving immediately. The driver maintained speeds in the range of 85-90kmph throughout the ride. I tried dozing off for some time, since the movie was too loud for my liking - but couldn't and finally tuned to some songs on my phone. There was heavy traffic as we neared Salem - traffic came to a standstill as we exited the flyover and entered town limits. We reached the Salem pick-up point at 2048hrs - it was a short stop, a very quick pick-up and we were off. The attendant came around with blankets, snack box and water bottle every time a new passenger came in. 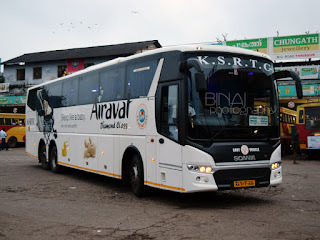 We stopped at Hotel Saravana Bhavan near Omalur Toll, at 2106hrs, for dinner. The hotel is small, and isn't a great choice if multiple buses were to stop there. The food was great and not very pricey. The crew did not rush with the passengers or keep honking - they just asked every passenger they saw there to get into the bus. We were off finally by 2139. The movie was switched off, and the night lamps were left on. I had a nice sleep after dinner. The bus had stopped somewhere to pickup fuel en route. I woke up briefly, and then continued sleeping. I finally got up when the bus stopped near Electronic city for a pickup - the time was 0015hrs then. The passenger hadn't turned up, and we had to wait. The bus finally got moving from there at 0022hrs. I moved to the front a little later and finally got off at Silkboard flyover at 0028hrs. Notes: The bus was KA-01-AE-8895, and she had around 25000kms on the odo. The bus was clean inside out, and it was very fresh inside. The packed blanket and well-stuffed snack box gave a very professional touch. The snack box is a great idea - and helps save some time of a tea break. The crew were properly uniformed and very well behaved as well. I really loved every bit of their service - except the movie part. They played no less than three movies one behind the other, and all telugu. I'd have been happier if they played one movie less and perhaps replaced one with a hindi movie. Overall great service from Orange. Will I take this service again? Absolutely Yes! 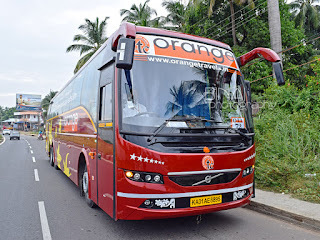 Why wouldn't I travel with Orange again? ?